An easy recipe for chocolate ice cream recipe you can make quickly that the kids will love. No cream, no eggs. You've just made a batch of homemade ice cream from one of your favorite recipes and want a different way to serve it for the enjoyment of your children or family or friends. Try an ice cream sandwich! 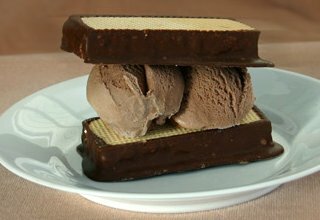 It consists of: 2 scoops of chocolate ice cream sandwiched between two chocolate dipped and nougat filled wafers. Although hard to find, one or twowafer manufacturers still produce these delicious chunky and chewy wafers; the sandwich in the photograph lasted only just long enough for the photo shoot before being devoured! 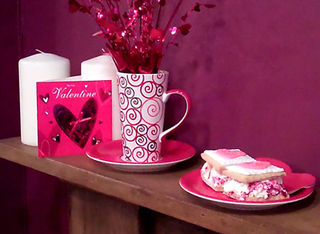 Valentine's Ice Cream Sandwich - now there's something special! Raspberry ripple ice cream sandwiched between two cookies with a special 'loving' message just for your Valentine. Read more about Valentine's Day Ice Cream here. For a different type of ice cream sandwich you can use soft, chocolate chip cookies instead of wafers (the larger the better!) and just put a dollop (single scoop) of ice cream between them; squeeze gently and trim off the excess at the edges. Serve straight away or put them in the freezer to serve later as a cold treat. For variety, sprinkle chopped nuts or coconut or add one of many toppings such as toffee or chocolate sauce. For completely homemade ice cream sandwiches we make our own ice cream AND our own cookies. We like to use our own chocolate chip cookies recipe (courtesy of my son Oliver), making sure we bake the cookies that extra bit big and then cram into them our favorite vanilla ice cream or chocolate chip ice cream. Croissants and brioches also make great sandwiches - serve them warm from the oven with butter or syrup or your favorite sauce and then sandwich a scoop of ice cream in the middle. Delicious! Do enjoy an ice cream cone? Visit my gallery of cone pictures and be inspired by the amazing variety of colours and flavors.